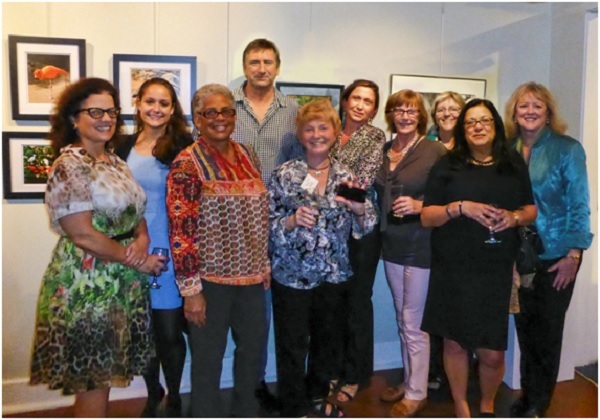 The Bermuda Society of the Arts is currently hosting an exhibit called H-appy ART, a collection of works from ten photographers who took Theresa Airey’s iPhone/iPad art class. The exhibit aims to show off the unique types of photography that can be achieved using only a smartphone or tablet computer and the artistic sensibilities of the photographers themselves; apps are able to achieve much on their own, but it takes a person with a sharp eye to modify the results by reducing, adding, and blending effects. All the images in the exhibit were created by working with apps on an iPhone or iPad. Some were merely post-edited for contrast, color, and clarity, while others were accomplished with apps that render a more painted look to the photograph. H’appy ART exhibitors: [L-R] Nicky Gurret, Sarah Cook, Brenda Swan, Chris Gibbons, Theresa Airey [Instructor], Anneli Christiansson, Jane Maycock, Sylvia May, Carol Green, Barbara O’Shaughnessy. The exhibit displays the ever-changing nature of technology and springboards from the dynamics of a new photographic era in which new ingenious apps are available regularly. This new art form is created in a border zone between photography and traditional art, and is therefore equally diverse in its approach. While the original images may have been taken with iPhones, DSLRs, or traditional “point and shoot” cameras, all the final images are from app-driven means of creating artwork. Only three of the ten exhibitors in this show had ever shown work before, and two of the first time exhibitors sold pieces in the show, a testament to the high level of art able to be achieved technologically. The next iPhone/iPad Photography workshop, set to begin on February 8, is targeted towards anyone interested in serious iPhone/iPad art, from a beginner to a professional photographer. If you’re interested in taking part, please call the Bermuda Society of the Arts for more information at 292 3824.